Vaz at the NCOGS annual meeting. 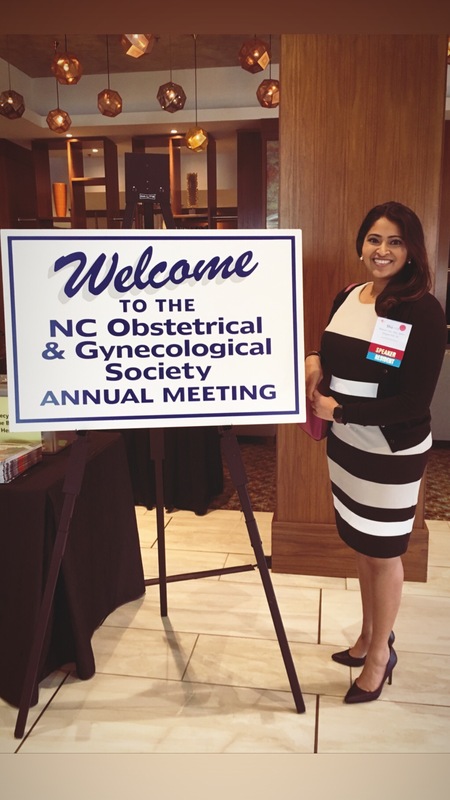 Congratulations to Dr. Sharon Vaz, a resident in the UNC OB-GYN Class of 2019, for winning Best Resident Presentation at this year’s North Carolina OBGYN Society meeting. 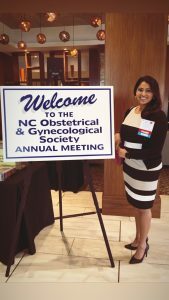 Vaz’s study was a retrospective cohort study of 2,719 women admitted for labor induction at N.C. Women’s Hospital between 2014 and 2017. She found that delaying amniotomy for more than eight hours after the start of oxytocin for labor induction was associated with significantly higher odds of cesarean section that increased with escalating Body Mass Index (BMI).